It was one of those nights in Colorado. Scott Feldman made just two bad pitches on the night, but the Rockies made him pay. Feldman gave up a pair of two-run home runs, and they came off the bat of a backup shortstop, and the opposing pitcher. The home run Feldman gave up to Rockies starter Jon Gray was reportedly the largest in the statcast era. 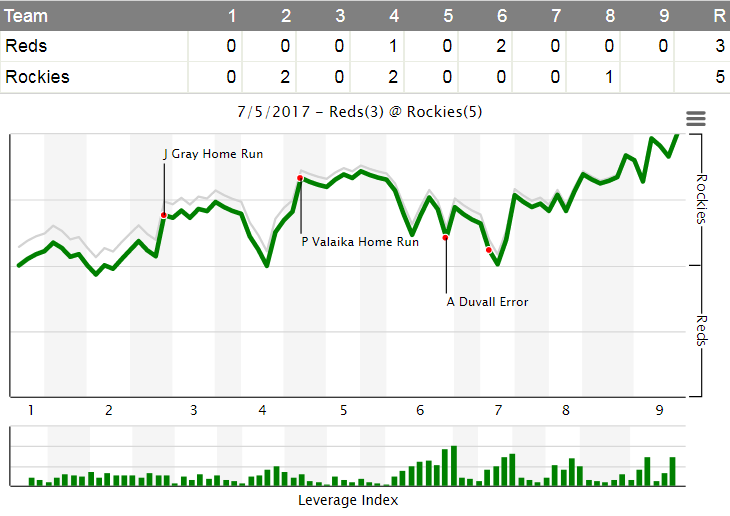 The Reds tried to climb back into the game. They got within a run, but squandered a couple good chances to get over the hump. The Reds also got screwed on a pretty terrible call (see more below). The Reds will go for a series split late tomorrow afternoon. According to FangraphsÃ‚Â WPA statisticÃ‚Â (winning percentage added), the most important play of the game wasÃ‚Â Eugenio Suarez grounding into an inning ending double play in the 7th inning (Reds had runners on 1st & 2nd, trailing 4-3).Ã‚Â That play decreased the Reds chances of winning by 17.0% (from 40.2% to 23.3%). Scott Feldman‘s run of three consecutive quality starts ended tonight. It’s hard to fault him for giving up a home run to the opposing pitcher, as you often just want to throw strikes with your opposite number at the plate. If you take that away, he would have had a really nice start. Feldman allowed just 1 walk, while striking out 6 tonight. Ariel Hernandez, who was just called up today for Devin Mesoraco,Ã‚Â was great in relief again. He didn’t allow a hit in 1.2 innings, and struck out 3 (did allow 1 walk). I really don’t know how the Reds can send Hernandez back down at this point. This guy is proving to be able to get MLB hitters out, and has some incredible stuff. Keep him up until he proves otherwise. Joey VottoÃ‚Â reached base four times, including his first triple of 2017! Scooter GennettÃ‚Â andÃ‚Â Zack CozartÃ‚Â eachÃ‚Â had 2 hits tonight. Gennett was hitting in the cleanup spot! Every starting position player had a hit except for Scott Schebler tonight. Jose PerazaÃ‚Â got picked off in the 8th inning representing the tying run. Replay clearly showed that Peraza was safe, but somehow the call was upheld. Nonetheless, it was a dumb play by Peraza. Scott Schebler went 0 for 4 with 3 strikeouts, but he did have 3 hits yesterday. Tony CingraniÃ‚Â gave up a big insurance run to the Rockies in the bottom of the 8th. Nolan ArenadoÃ‚Â had an error tonight! All statistics are used courtesy of Fangraphs, ESPN Stats & Info, and Baseball-Reference. The irony of Price citing the importance of getting on base and his leadoff hitter has a .295 obp… That sums it all up. He wasn’t handed the best red teams’ ever, but I’ll never understand why they throw Hamilton out there every game in leadoff. It is insanity. Doing the same things over and over, and expecting different results is the literal definition of insanity. If you’re rebuilding, why aren’t we then trying, and experimenting different lineups….I guess it’s insanity to expecting something new…. That’s not really the literal definition of insanity, anyway. There probably isn’t such a definition. It is interesting to consider why they do continue to bat Billy first, though, since doing so magnifies his weakness as a hitter. Billy bats 1st because Price doesn’t understand offense. He was a pitcher, then a pitching coach. He didn’t give offense a fleeting thought until a few years ago, making him pretty unqualified to fill out a lineup card or make any decision related to offensive matters. Because of his lack of experience with offensive matters, I think he defers to the Dusty style, since Dusty was (at one point) a fairly good offensive player. That is my working assumption, at least. It’s a quote misattributed to Einstein. Of course it’s not the “literal” definition, but it does drive people insane doing the same things over and over and expecting different results. Like me expecting Price to really be different than he has since he took over. Is it possible that the organization is giving Hamilton and Peraza every possible chance to prove that they can/can’t hit in the top of the lineup? I know, I know, they shouldn’t be taking at bats from Votto. But I’m willing to bet a lot of us were feeling pretty strong about Peraza at the end of last year. However, this year and a larger sample size has us feeling uneasy about his long term status. I don’t know how much rests with price verses the gm/ownership on lineup construction but you can’t play a guy who is not on the roster. Ask Bob Steve and Reed. If these guys don’t prove themselves I bet they have a reduced role or find themselves somewhere else next year. DW knows what he’s doing. Hamilton every chance, sure, Peraza is 23 with less then 600 career at bats and hits in the seven hole most games, two very different situations………tho I don’t disagree with what you’re saying. The pitching staff competed and gave up only 6 hits but two left the yard.We had 11 hits and 3 walks on offense but none left the yard.This one was on the offense as was Monday’s loss.Have to be able to score more then 3 runs at Coors or any where else to win but its a better feeling when for 3 straight games the pitchers kept us in the game.Much better then what we have experienced for most of this year.Go Reds. That’s baseball though. 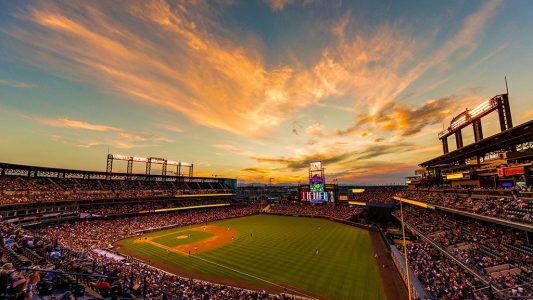 The Rockies had 10 hits on Tuesday and scored 1 run. Yes… Analysts will say that is “sequencing” and that sequencing is luck more than anything else. I’m not 100% sure I buy that but there has been a lot of research that the notion of clutch hitting is misguided. That research has pretty much determined that in most cases clutch hitting is luck and very few have been significantly better or worse in the clutch than their career norms over a large enough sample. So, that suggests that perhaps sequencing is mostly luck. I’m not sure what to make of it because of all the “baseball” factors I try to consider. The research is what it is though and is rather compelling. As for Billy he is what he is and the Reds must feel it is good enough or they are willing to give him the rest of the year to prove in year 4 that he isn’t good enough.I think you can continue to let him play but not hit lead off.You can hide him a little in the 8 or 9 hole but giving him the most at bats is just dumb.The real issue for the team is that you can’t hide him and Peraza and of course the pitcher in the lineup.Its one thing to be a bad hitter but its another to have no power at all to hit a ball to the outfield.Peraza has hit some rockets but more often he hits weak pop ups or grounders as does Billy and well then there is the pitcher.This will sort itself out this year but I am more concerned with sorting out the starting pitching or at least giving some a few starts. Which of those results do not belong in the top half of the lineup? Ouch. I agree. No way you can really bring him back up if he’s still walking 6 guys at AAA in a game. Unacceptable. Thing that concerns me is that he’s never really had issues with control. Not nearly to that degree anyway. He’s a big guy and mechanically he has a lot going on. Sometimes he’d get out of sorts and his command would suffer but I haven’t seen a line like that from him… not ever… Something is wrong and it isn’t getting better. Not sure what to do with him at this point. Odd game. Sure felt as if we would come back to win that game in the middle innings. Billy seemed to have a pretty good month of May…wonder what has caused him to regress…or what caused him to do well in May? It’s pretty obvious that it’s a rash of minor injuries that are piling up on him. Shoulder, thumb, and now his back. A few weeks ago I was hoping for a 10 day DL stint, for a recharge….especially when Winker was here. Maybe the All Star break will provide some relief. Part of an audio montage lead-in the Chicago sports radio station likes to play before every Joe Maddon call-in interview he says ‘I’m not going to bat my second baseman leadoff because that’s what the book from 1947 says to do’. I always laugh and cry at the same time for that one. Billy is just hard to figure.He will have a few good games and then even while having a good game he just starts doing bad things at the plate.Some at bats he actually does work the count and the other night he got a big two run single on a 3-2 pitch.Other times he swings at the first pitch.He just can’t hit for power so the infield is in and so is the out field.His good games are a looper here or there or a grounder that he beats out.His hits are weak hit balls and so are his outs.Pitchers don’t fear him as a hitter they fear him as a runner and rightly so.He can’t bunt and doesn’t walk.He is a little guy that plays a gold glove centerfield with speed.My suggestion to him would be to beef up some and learn how to bunt because when he loses a step well he is done.He also is second on the team in strikeouts as well.He may do better in a platoon system where he can get some rest and keep his body fresher but he needs to get stronger in a big way. Is Peraza working on hitting the ball to opposite field the reason for his bad approach? To paraphrase Sparky: Please don’t embarrass Billy Hamilton by putting him in the same sentence as Rickey Henderson. By the end of Henderson’s fourth season, his OBP was .397 and he’d stolen 319 bases. His walk rate (14.6%) was higher than his strikeout rate (11.2%) and he’d even hit 26 home runs (and go on to hit 297). No one who has watched Billy Hamilton and saw Rickey Henderson play has even the slightest, tiniest notion that Hamilton could become Henderson. Henderson averaged 6.7 WAR in seasons 2-4. Hamilton becoming Henderson is not possible, let alone probable. Even framing it this way perpetuates the fantasy that is Billy Hamilton in the eyes of a segment of Reds fans. If the Reds front office feels this way, it falls under theory #1 – incompetence. Try this framing instead: Billy Hamilton is much closer to being Willy Taveras than Rickey Henderson. Although Hamilton isn’t as good of a hitter as Taveras was. Stats don’t lie. Since the data we can see doesn’t support the claim of a mysterious unproven positive effect by Hamilton’s presence at the top of the lineup, you’re now suggesting there is “proprietary data” that must be smarter. Funny how the proprietary data of other MLB teams – including ones at the top of the standings – disagrees with this claim. Again, you keep emphasizing the stat about Hamilton scoring when he gets on base as if that’s all there is to run creation. Speed is actually a pretty small part of it. Batters who hit the ball, and with power, drive in runs. By getting on base more often, they advance runners ahead of them, also scoring runs. Billy Hamilton is one of the worst players in baseball at these things. And has been for going on four years now. Try #4: The Reds manager is a former pitching coach; holds an outdated view that the leadoff hitter should be a slight-bodied, fast player to create “havoc;” and stubbornly clings to a batting order beyond all rationality. Maybe that’s the same as #1 on your list, with a little more detail. I actually agreee with you. I’m trying to gauge what I believe the Reds thought process to be. I don’t think he can be Ricky Henderson….I don’t even think under the most optimal circumstances he could be Willie McGee. Move everyone up and drop Billy to 9th. He still has 50% run scoring ability in front of Cozart and Votto. He just does it one less time a night. I get the guy is fast, but even Votto can get a triple. You only need a single to score just about everyone in this lineup from second base so I don’t buy into the Billy scores when he’s on. He scores because he has some of the best hitters in the game behind him. See, I don’t understand why they aren’t doing this. It makes excellent sense, much more than hitting him #8 where his speed benefits him less as the pitcher will likely bunt anyway. I love the idea of him in the 9 hole. The thing that makes it all the more frustrating is that the Reds hit him there some last year. He didn’t do so well but really and he hit very well in a small sample leading off last year: .272/.357/.335 … That was 198 PA. Maybe they are basing a lot of it on that? I don’t know, in 47 PA in the 9-hole he was: .250/.283/.364. Overall, for his career, leading off his line is: .246/.301/.339 in 1375 PA… That’s who he is as a leadoff hitter. Time to hit him 9th again. Billy is hitting .305/.397 in Reds wins. Billy is hitting .193./.250 in Reds losses. When Billy goes, the Reds go. My guess is you’d find similar stats for any team’s leadoff hitter since that person gets the most at bats. Another way to look at it is if the leadoff hitter is so important, why do the Reds put their worst hitter there? Does Billy getting hits improve defense and pitching? I still hold out hope that 8-9-1 can be Peraza, Hamilton, Votto…with the pitcher batting 7th!! Too extreme for everyone, I’d say. I’d love to see it, though. Give Votto the most AB while also hitting two “real” hitters in front of him. He’s only the leadoff hitter once per game. The rest of the time, it’s like he’s still batting 3rd. Think your SP probably gets an extra AB every couple of games in that scenario. Not sure I like it. I also don’t like those two low OBP guys in front of Votto. The problem really is two very low OBP guys in your lineup along with the pitcher. Kicking the pitcher out since everyone has to bat their pitcher in the NL, still means that 25% of your lineup basically stinks. Hamilton can still bring a ton of value with his defense and baserunning (when he gets on) but Peraza has shown no such plus abilities. 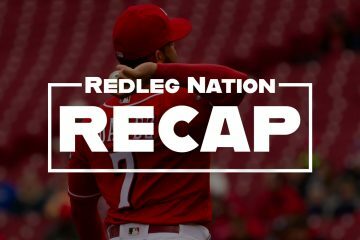 It’s still a rebuilding year #RebuildBinder so yeah, Peraza has to play but if he continues on his current path, he can’t be an answer going forward. Schebler still makes that deal a win but Peraza is, at best, a utility player. The Reds are right in allowing him the chance to show he can be more however. The increased AB for the pitching slot in the order is mitigated by the use of a PH and double switch in the NL. With Peraza and Hamilton hitting after the pitching slot in the lineup, they would be prime candidates for a double switch to move the pitchers slot in the lineup further down. Plus, we are in the age of the starter going 5 innings. That’s only 2 ABs max – unless we are way ahead. My first thought was never ever hit Billy and Peraza back to back at any time for any reason.However if they are both going to play every day then why not go with Patrick’s idea above.Put them back to back but in the bottom of the order makes more sense then at the top which gives them more at bats every game.It certainly gives Joey more at bats and that is always a good thing.Works for me. Don’t fret. By August 1, Billy Hamilton very well could be chasing fly balls in Chavez Ravine. Is that a rumor? Or just your theory. The Dodgers have a lot of OF’ers already. Neither, really. I was listening to MLB Network radio the other day and they were discussing the Dodgers and needing a true CF and bullpen help. Reds have both. One said that the Dodgers were sizing up some CF options. Even though they are 22-4 in their last 26 games, they have some minor weaknesses to address. Taylor would move from CF to LF and Bellinger from LF to 1B. Adrian Gonzalez’s injury is worrisome at 1B. Joc Pederson and Kiki Hernandez haven’t done much on offense in CF. Another Dodger minor weakness is speed. In their lineup, BHam doesn’t need to be a main table setter and would fit in nicely at #8. Maybe a change of scenery for Joc Pederson might right his ship. He hit the snot out of the ball in the all-star HR derby at GABP in 2015. He had a nice HR a couple of weeks ago at GABP. If my memory serves me correctly, he hits pretty well at GABP. Want an OF with less service time than Pederson and the Dodgers have OF/CF Alex Verdugo a year or so away in the minors. But a stout reliever would have to accompany BHam in that trade scenario. Bat Billy 9th….thats what? 10-15 atbats less a month then leadoff? Makes too much sense!! They should know if they want to keep Cozart by now? My guess is that they haven’t sent Peraza down so they’re open to offers and might move him? Hopefully Zack will continue to hit like last night! Peraza currently backs up Zack and also platoons w/Scooter. Give him a little OF time too or let Scooter spell Suarez. Peraza needs to play alot if he’s staying. Hernandez is flat out nasty! Herget > Brice with Cingrani & Peralta and they can do just fine in the pen without Lorenzen. Start stretching him out asap! We have next to no groundball pitchers on the horizon and we need him in the rotation. Not to mention he’d pull a Jon Gray game affecting blast atleast 3-4x a year! Sign Hunter Greene for God sakes!!! To fail is an organizational disaster that can’t happen! Indiana football vs Ohio State in August! As a Hoosiers fan thats like looking forward to an Arroyo start but its still football! Pls make Reds baseball relevant (watchable) in the 2nd half! Really like you’re leadoff platoon idea. Scooter would sit vs LHP with Peraza playing 2B? Would he hit leadoff in that scenario? Not sure you can dismiss Brice so easily but Herget is probably better… Love the idea of Lorenzen starting. I’m hoping he gets a shot in ST next year. Failing to sign Greene would be really bad but I’m not sure it’s an organizational disaster. 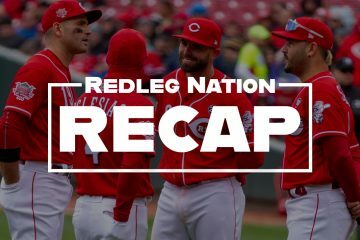 All the Reds really should do is offer him full slot money (which is more than what the overall #1 signed for) and apparently if they do that, they have about $100K or so that they’ll need to pay a penalty on (this shouldn’t stop them from signing him)… Maybe the kid doesn’t want to sign? Maybe he’s asking for something strange outside of the money and the Reds don’t want to set that precedent? Maybe some other team is tampering? Anyway, I think the Reds get the deal done. Too much risk for Greene if he doesn’t sign in my opinion. Oh and no peraza wouldn’t hit leadoff in that scenario. Dumb question on my part. Suarez would.